Foot pain is a very common ailment that can range from mild discomfort too a debilitating condition that limits ones quality of life. Plantar fasciitis is a frequently diagnosed condition characterized by chronic heel pain and pain along the sole of the foot. Although there are several conditions that exhibit this pattern, plantar fasciitis displays a symptom called “poststatic dyskinesia,” which is pain with increased intensity when rising from a resting position. People with plantar fasciitis frequently have severe foot pain when they first get out of bed in the morning, but the pain diminishes with activity and later returns as the day wears on. Plantar fasciitis can have several different causes but is usually a result of repetitive stress injuries to the feet. This condition is commonly seen in patients who stand on hard flat surfaces for prolonged periods of time. Runners and joggers that train on pavement are prone to this condition. Plantar fasciitis can also occur for no known cause or as part of the aging process. A professional medical diagnosis should be made to determine the appropriate treatment approach. In addition to plantar fasciitis, there are several other possibilities that can cause foot pain and require a differential diagnosis, some of these include peroneal tendonitis, gastro-soleus complex, plantar calcaneal bursitis, metatarsalgia, heel fat pad syndrome, and several others. Scar tissue may form at the heel of the foot as a result of chronic irritation and inflammation of the plantar fascia. If the inflammation, scarring, and irritation become chronic they can resulting calcification of the fascia at its attachment point on the calcaneal (heel) bone. 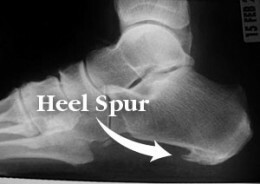 This calcified fascia appears on a foot x-ray as an hook shaped bone spur on the sole of the foot at the heel. When fasciitis goes untreated and becomes chronic to the point of bone spur formation, non-invasive techniques may not be effective and surgery is often required. Practitioners such as chiropractors, physical therapists, acupuncturists, and massage therapists can provide a variety of effective modalities for the treatment of plantar fasciitis. Techniques such as micro current, ultrasound, interferential, acupuncture, transdermal medications, and manual therapies can provide effective and permanent pain relief. 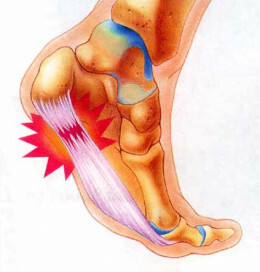 Physicians can inject a steroid into fascia attachment at the heel to reduce local inflammation. 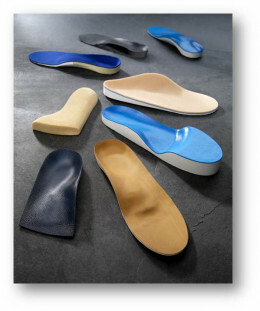 The opinion of using inserts and orthotics is more a matter of philosophy than medical science. Some practitioners believe that providing arch support in the form of orthotics will take pressure off the plantar fascia and allow it to heal. Others believe that the arch naturally falls with normal wear and aging of the feet. As the arch begins to break down and drop, there is increased tension on the fascia as the foot elongates, which causes inflammation and pain in the sole of the foot. In this case, practitioners encourage stretching the fascia to allow for the new foot position so the fascia can heal on its own. Hard orthotic inserts are believed by some to only further weaken the arch and prolong irritation of the plantar fascia. The #1 most common self-help treatment for plantar fasciitis is golf ball massage. Yep, a plain old golf ball. Placing a golf ball on the ground and then rolling it under the sole of your foot will stretch the fascia and improve circulation. The golf ball is just the right size and shape to effectively massage the sole of the foot. Heel lift inserts, or just wearing shoes with ½ inch to 1 inch heels, can be beneficial and provide relief for some people when tight calf muscles and/or Achilles tendinitis may be contributing to the foot pain. Calf stretches with full extension of the toes (pulling the toes up) is a good stretch for the plantar fascia. There are foot supports that can be worn at night that keep the ankle flexed and toes extended to stretch the fascia while you sleep. Hot water foot soaks. Although ice may feel good and temporarily numb the area, ice causes constriction of blood vessels and slower healing times. Unless there are acute signs of redness, swelling, heat, and pain, or you just need some immediate pain relief, it is best to avoid ice and stick with heat. When in doubt as to use heat or ice, do what provides the most relief.